The Islamic State in West Africa (ISWA), a faction of Boko Haram sect, attacked Gudumbali, Guzamala local government area of Borno state, on Tuesday. It is the second time in three months that the village will come under attack. 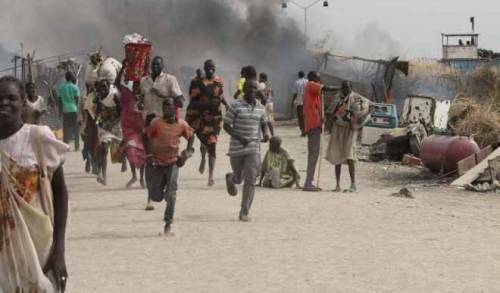 The insurgents moved on the village around 7pm and engaged in a gun battle with troops of the Nigerian army stationed in the area. Hundreds of residents fled into bushes for safety as the exchange of gunshots reportedly lasted for hours. In the past month, Boko Haram insurgents have launched attacks on villages and military formations in Borno and Yobe states. On Tuesday morning, the insurgents claimed to have attacked soldiers stationed in Arge, an area close to Lake Chad. In the statement seen by TheCable, the insurgents said they killed seven soldiers and left 10 injured. While the military says it is intensifying efforts at ending the attacks, Abubakar Elkanemi, shehu of Borno, recently said the people of the state are still under the insurgents’ siege. “Nobody can dare move out of Maiduguri by 10 kilometres without being confronted, attacked by Boko Haram,” he had said. Sani Usman, spokesman of the Nigerian army, did not respond to TheCable’s enquiries on the attack. An officer at one of the battalions in Borno, however, said things would be under control. “I am sure the troops there would repel the attack,” he told TheCable.